This book offers a scholarly yet accessible overview of the role of lobbying in American politics. It draws upon extant research as well as original data gathered from interviews with numerous lobbyists across the United States. It describes how lobbyists do their work within all branches of government, at the national, state, and local levels. It thus offers a substantially broader view of lobbying than is available in much of the research literature. 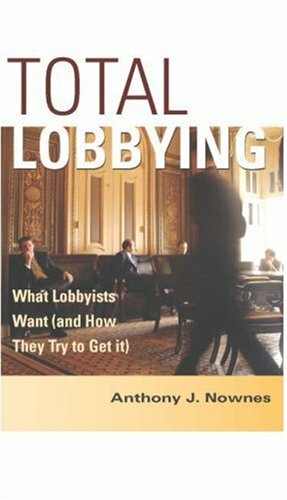 Although tailored for students taking courses on interest group politics, Total Lobbying offers an indispensable survey of the field for scholars and others concerned with this important facet of American politics. What Does Public Policy Lobbying Look Like? What Does Land Use Lobbying Look Like? What Does procurement Lobbying Look Like?